Green lentil rice makes a great lunch box food. 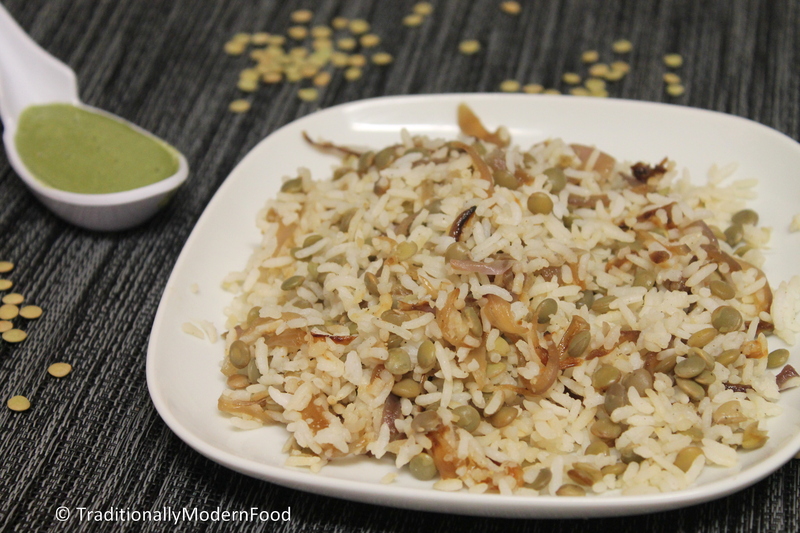 Caramalized onion with cooked green lentil gives nice flavour to this subtle rice. Now a days my hubby started taking lunch to his office, my biggest worry is what to pack for him. Somehow variety rice is his first choice, well to be frank I am happy with it as it is easy to cook:-) Weekend is almost over, my confusion will start from now on. This week because of Christmas just three 3 days I should pack lunch, still my mind is wavering about his lunch. Today I prepared Pongal for my son, while soaking moong Dal, I saw Green lentil in my kitchen pantry and remembered this Rice, tomorrow I am going to make this with brown rice. After returning from our trip, I tried her recipe but used white rice instead off brown rice. Well those days I had big obsession for brown rice, but now a days we stopped eating white rice in home. This Rice is perfect for kids lunch too, it has protein, mild sweetness from onion and less spicy. Protein Rice with green lentil, caramelized onions and mild seasoning. Perfect for lunch box. What a thoughtful and caring wife you are Vidya! This is a perfect and healthy lunch! Healthy rice! Looks super delicious!